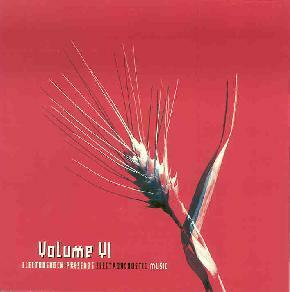 Various Artists - "Electroshock Presents Electroacoustic Music Volume VI"
Italian artist, Francesco Galante's entry is a combination of avant-garde sound experimentation and ambient space. The 10 minute track consists of a few different segments that have clear beginnings and endings. One section sounds like a symphony of manic raking over pipes and/or strings, including swiftly pulsating space tones that fly from left to right, right to left. Suddenly a door slams, the last thing I expected and having the volume up high with headphones on I just about jumped out of my seat. Great use of sound and the mixing job is a big part of what makes the track interesting. From Lithuania, Antanas Jasenka's track could be sub-titled Music for Wind Tunnels. I dig the howling tones and female chorus of mechanical space whispers. There's also a bizarre, distorted hip-hoppy rhythm. Kind of like a rave party launched into a time warp that slows time to a near standstill. But that's not nearly as odd as the brief moments of burlesque music. The music doesn't so much develop as it does segue through various sound and tone themes. Interesting. Pete Stollery is from the UK, and listening to his piece I wondered if he works in film sound efx. He certainly could. Experimental sound patterns, from balls falling down a slide, various subtle percussives, conversations, and a banquet of efx, both jarring and spacey, makes his contribution an interesting, if less than coherent, collage of electro-acoustic sounds. Spain's representative, Rodolfo Nunez, contributes a track that at times made me feel like I was underwater, and at others like I was in a forest with the crickets chirping and other animal sounds. In the last minute, however, the volume shoots up and the intensity level rises for the rush to the finale. Also from the UK, Carey Nutman's track has a similar underwater theme, this time like being in a submarine and experiencing Nutman's interpretation of all the incumbent sounds. Like the other contributors, Nutman's track focuses on pure sound exploration and development, but feels more linear and goal-oriented than the other more collage-like tracks, which often feel like several experiments glommed into one. Also more focused is Brasilian artist Jorge Antunes' entry, which is an intense, somewhat whimsical, avant-classical symphony of freaky space sounds and trippy motifs. High-pitched tones entrance the listener as pounding waves of synth melodies come crashing down. And finally, Finland's Jukka Ruohomaki contributes a nice piece of ambient space with lots of cool freaky sounds to keep things interesting. In summary, an excellent set of electro-acoustic explorations that combine the ambient, noise, and the avant-garde. And taken from this perspective, even the tracks I felt lacked a clear sense of direction are still impressive examples of the artists' sound experiments.